BioLargo’s subsidiary Odor-No-More has been invited to present at the China InnoSTARS Competition in Houston, TX, on May 14-15. China InnoSTARS is a prestigious platform for US-based technology companies to connect with strategic partners and investors in China. Winners of the preliminary competition will be invited for an all-expenses paid trip to China to present to hundreds of investors, fund managers, and potential clients and partners in Chinese innovation hub cities for the semi-final and grand finale competitions. The program is sponsored by the US China Innovation Alliance and the Ministry of Science and Technology of the government of China. The competition is judged by esteemed representatives from world-renowned organizations including Ecolab, AECOM, Danaher, Shell, and many more. Judges will decide which organizations move onto the semi-finals and grand-finale in China, where companies will compete for international renown and cash prizes. BioLargo will be presenting on Odor-No-More’s CupriDyneClean Industrial Odor and VOC Eliminator, which is currently enjoying accelerating market adoption in the United States’ solid waste management industry and wastewater treatment industries. There exists a large and under-served market for effective, cost-efficient, and eco-friendly control of unpleasant odors and volatile organic compounds (VOCs) in China. 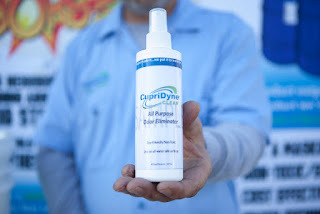 Odor-No-More’s CupriDyne Clean could benefit numerous cities in China while generating a significant new pool of revenue for the company.